Garden phlox is a showy landscape flower with large flowers that decorate a flowerbed during the second half of the summer. Grow garden phlox in a sunny location as a border or a backdrop to shorter flowers. Phlox prefers a moist garden soil and needs adequate ventilation around the foliage to prevent mildew from developing over the course of the growing season. After the foliage dies back in the autumn, cut it off near the soil level to winterize. 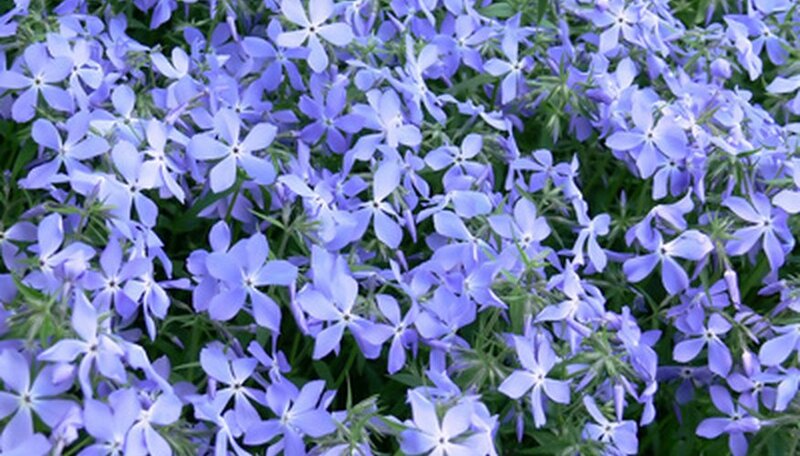 Remove spent flowers of the garden phlox to encourage a longer blooming period. Trim the plant back to remove all old foliage in the autumn. This will help prevent mold and decay from penetrating the foliage over the winter season. Leave approximately 6 inches of stalks above the soil level for locating the phlox the next spring. Thin the garden phlox in the spring to allow only four stalks per clump. If you desire a larger area of garden phlox, add additional plants, spacing them approximately 1 foot apart. Dig around the perimeter of the phlox plant with the spade or garden fork and carefully lift it out of the ground. Loosen the dirt around the roots of the plant. Remove any stones and dead stems from the clump. Slice down through the clump using the spade or sharp knife and divide it into three to five new shoots with healthy root systems. Remove the dead or woody central stem of the original plant. Plant the divisions into a prepared flower bed. Prune each phlox plant to no more than six stems when the plants reach about 6 inches tall. This will divert energy to the remaining stems, and the phlox will be healthier and produce better blooms. Remove phlox blooms as soon as they fade, either with your fingers or with a good pair of garden shears. The remaining blooms will be larger and brighter. Prune away the upper set of leaves as well, to promote air circulation and prevent disease. Prune the phlox to the ground in autumn, leaving a few short stems so you can remember where the phlox is planted. It may seem drastic, but the phlox will return in all its glory the following spring. Plant your phlox in well-drained soil. Check the label on your plant; some phlox thrive in full sun while others prefer shade. Till the soil 12 to 15 inches deep while adding 2 to 4 inches of compost. This will assist with moisture retention and drainage. Dig a hole for the plant that is twice the diameter of the root ball and as deep as the container. Space the holes 1 to 2 feet apart. Turn the container upside down and tap on the sides and bottom to remove the plant. Place the plant in the hole, making sure the top of the root ball is at the soil surface. Fill in around the roots with soil and gently pack it. Sprinkle a starter fertilizer around the base of the plant and water thoroughly. Apply a 10-10-10 fertilizer each month of the growing season. Water the plants immediately after application to assist with absorption. Soak the plants deeply once a week if rainfall is less than 1 inch a week. Cut old flower stems as the color fades; this will promote new blooms. Cut the stems to 2 inches after fall's killing frost. Divide tall varieties of garden phlox every two to three years in the spring to control disease associated with dense growth. Common purple phlox varieties include the creeping Sherwood Purple (Phlox stolonifera) and the vivid Purple Flame (Phlox paniculata). Other popular species include the violet-blue Andre (Phlox paniculata) and the lavender Laura (Phlox paniculata). Purple phlox plants range in height from just a few centimeters for the creeping varieties to 4 feet tall for the garden phlox varieties. Most phlox varieties bloom from July through August or September. Purple phlox varieties grow well in USDA zones 4 to 8. All phlox species thrive in fertile, well-drained soil in sunny to lightly shady locations. Purple varieties of garden phlox are commonly used as borders in perennial gardens and to attract hummingbirds in bird gardens. Creeping phlox makes vibrant ground-covers in natural gardens and rock gardens. Purple phlox plants are susceptible to root rot and powdery mildew. Spider mites and tarnished plant bugs are frequently a problem in dry, hot climates. 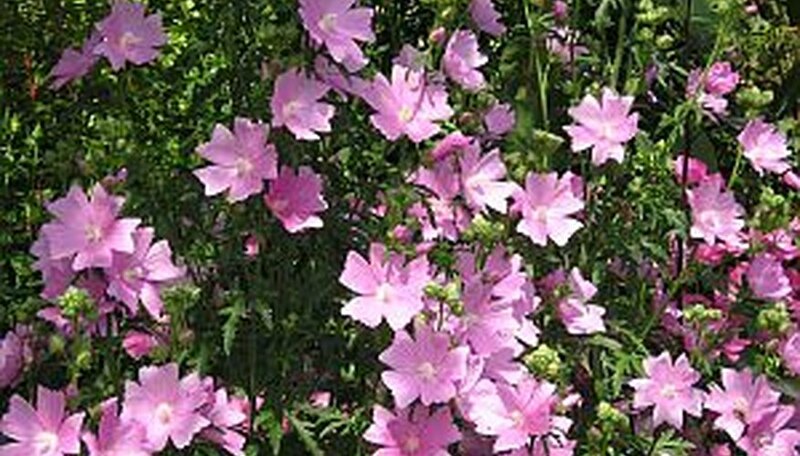 Plant phlox in an area where it will receive at least six hours of direct sunlight each day. Apply a flowering plant fertilizer when new growth starts each spring following the directions on the packaging. Repeat application each month during the growing season. Water your phlox weekly to keep the soil moist over the spring, summer and fall. Avoid wetting the leaves and stems when watering to lower the risk of disease. Add a 2 to 3-inch-deep layer of mulch around the base of your phlox plants using bark mulch, compost or pine needles. Spread the mulch 1 foot beyond the base of the plant to keep weeds away and retain the moisture in the soil. Dig up your phlox in the early winter if it has been four to five years since it was planted and divide the body of the plant into three or four divisions. Plant each division out into a new spot, keeping the plants at least 18 to 24 inches apart to allow room for growth. When in bloom, phlox are covered with groups of small, sweet-smelling, star-shaped flowers from pale pastels to vivid brights, including pink, red, lavender, purple and white. The two most common types are the spring-blooming creeping phlox and the tall garden phlox that bloom in mid to late summer. Use creeping phlox as a ground cover in rock gardens or woodland plantings. Use taller phlox in the background of narrow borders or between different sized plants in wider boarders. Phlox attract hummingbirds and butterflies and make good for cut flowers. Plant phlox in well-drained soil. Tall garden phlox do well in full sun or light shade, but some other types prefer more shade. Plant phlox 1 to 2 feet apart in a hole twice as wide as the diameter of the pot your phlox came in. The crown of your plant should be 1 to 2 inches below the surface of the soil. When the stems reach about 6 inches tall, cut back all but five or six to encourage fuller blooms and increase air circulation. Remove faded blooms to encourage more flowers and to keep the blooms their original color. Apply a thin layer of compost covered with 2 inches of mulch in the spring to help retain moisture and control weeds. Plant garden phlox during early spring, just after the final frost of winter, in a location that receives direct sunlight throughout the day. Spread 4 inches of organic compost over the planting site and use a garden tiller to incorporate it into the soil. Water garden phlox once per week during spring, summer and fall. Reduce frequency to once every two weeks during winter. Increase watering to twice per week during periods of drought, when more than 1 week has passed without rainfall. Feed garden phlox using a 5-10-5 NPK fertilizer in early spring to encourage the growth of flowers instead of foliage. Water thoroughly both before and after applying the fertilizer. Apply following the directions provided on the package. Remove dead or fading garden phlox flowers as soon as possible to prevent them from turning to seed. Pinch them off as close to the stem as possible and new flowers will replace them after a short time. Remove all but the five healthiest stems once the plant has grown to about 6 inches in height to increase air circulation. Thinning also allows garden phlox to grow more thickly and produce more flowers.